Sometimes news reaches out of the computer monitor and punches you in the gut. 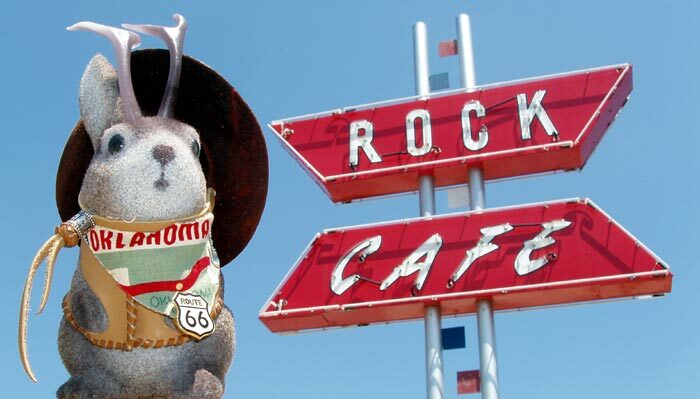 Such was the case when I checked Route 66 News last week and read this story about the Rock Café in Stroud, Oklahoma. 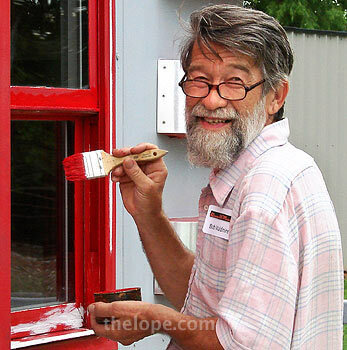 It was heavily damaged by fire last Tuesday, May 20, and is closed for the foreseeable future. 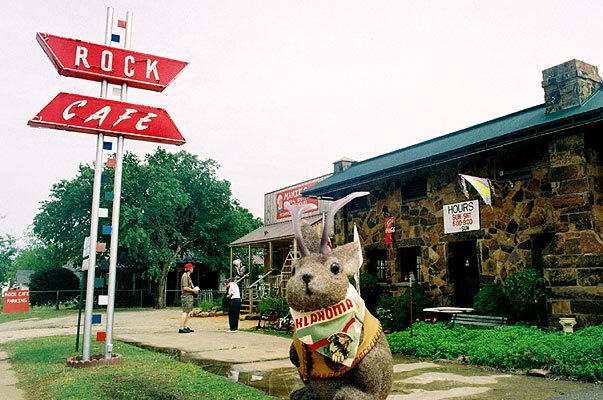 Here's Ace with the Rock's iconic sign on July 30 of 2005. I say "damaged" and not "destroyed" because the characteristic rock outer shell, seen here in May of 2005, remains. This lends hope that if owner Dawn Welch chooses to rebuild and does so on site, it will still have that characteristic look. The sign is also apparently safe, as is the gift shop next door. I do not know if the gift shop remains open. The Rock Café holds was a special place to me in that it was part of my "discovery" of Route 66 around Labor Day of 2002. Sure, I was raised in Joplin, Missouri, and had been on many a road trip that included bits of 66 out west, but it wasn't until a trip the previous week that I fully understood that many of the places I knew and loved were parts of the same continuous highway. The previous week, I had dropped my girlfriend at the Oklahoma City airport and intended to see "a bit of 66"...maybe as far as El Reno, I figured...before heading north and home to Hutchinson, Kansas. But I was seduced. The next day I woke up in a sleazy motel in Shamrock, Texas, with a new mistress. She had long straightaways and dangerous curves - and she was made of asphalt, neon, decay and renewal. But that is another story. The Rock Café had all of the better qualities of Route 66, as I discovered a week later when I picked the girlfriend up in Tulsa and talked her into riding with me between Tulsa and OKC - opposite the direction we needed to go - before I took her to Joplin. I just had to explore with her more of the road I'd "discovered." 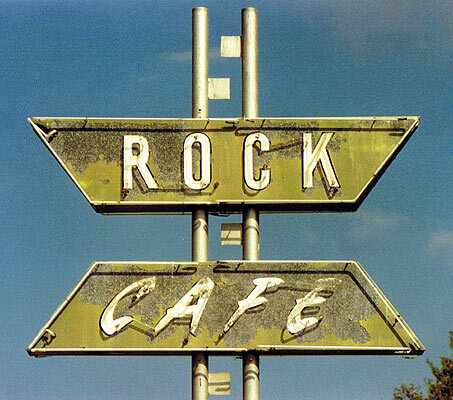 The Rock Café's sign had peeling green paint on that day in September of 2002, instead of the jaunty red it would later possess. I wanted a night shot of the neon, but we were much too early. The protruding squares on the poles were silver then. Attached to the poles were diagonal signs which read, on the west side: * Cold BEER * * Rt. 66 Souvenirs !! * Buffalo BURGERS! How could any reasonable person not want to stop? I believe it was a Sunday and the place was closed. 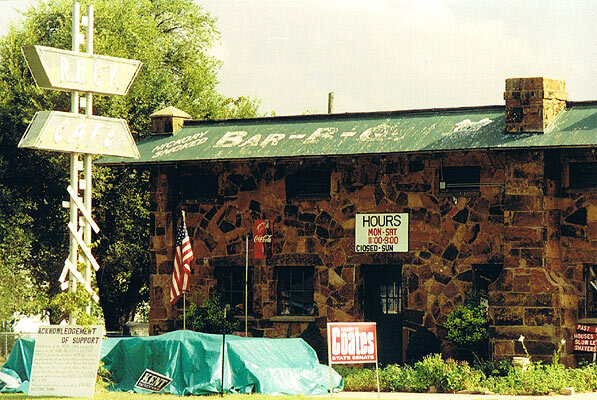 The front of the roof in 2002 read "Hickory Smoked Bar-B-Q" (Que?) and had a graphic of (I believe) a pig's face on it. These were gone by May of 2005. There was an Acknowledgement of Support sign in front, which mentioned the National Park Service's Route 66 Corridor Preservation Program, Stroud National Bank and various other parties. It also mentioned the cafe's listing on the National Register of Historic Places, a designation Welch had obtained for the 1939 building. 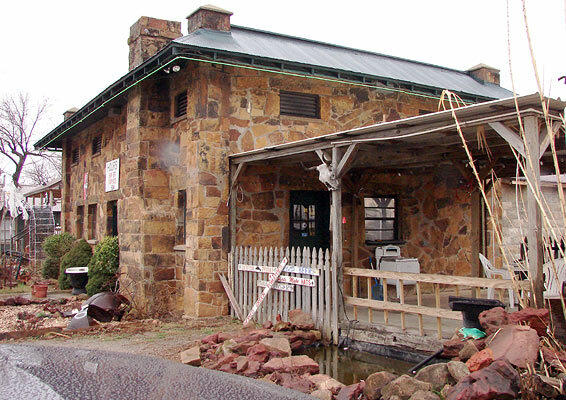 Mamie's, the café's gift shop, had not yet been added on the east side of the building. Flash forward to May of 2005. 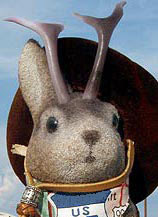 By this time I was travelling with Ace Jackalope and, on a trip with my mom and brother, I suggested we stop for a sandwich in Stroud. 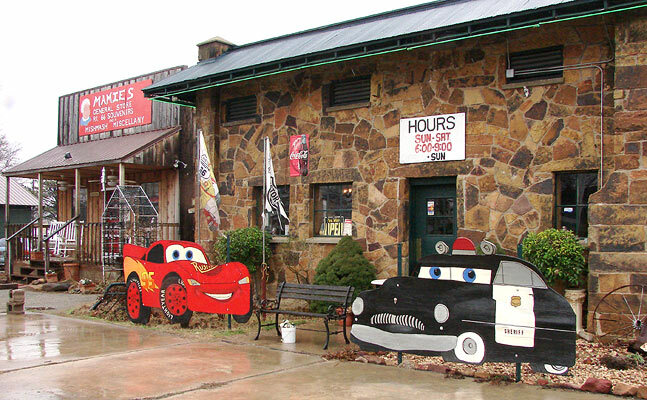 Note the sign is now red and the gift shop has been added on the far (east) side of the building. I'll miss the Rock's sandwiches. 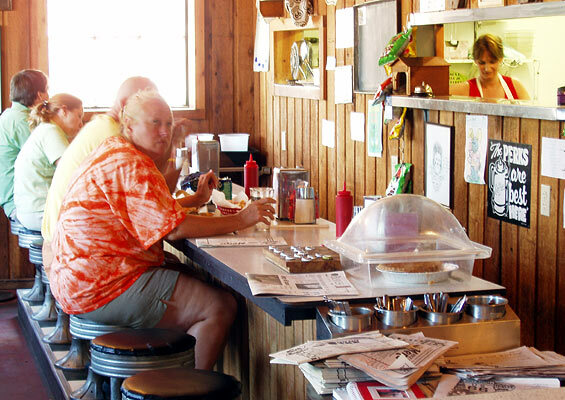 Welch really understands that food is made of texture as well as taste, and biting into one of her sandwiches was a pleasant excavation into layers of both. I'm tossing in more pictures than I usually would. I've received a couple emails from people who want these. Once again I was too early for a night shot. 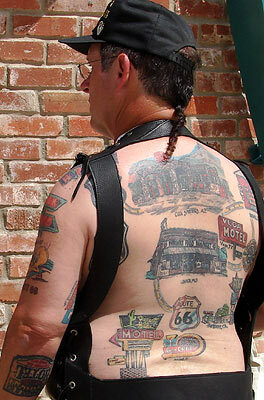 I don't know the story behind the wooden motorcycle but two years later I would meet the maker of the Route 66 map behind it, Bob Waldmire and the guy to which the tattooed arm belongs, Ron Jones. 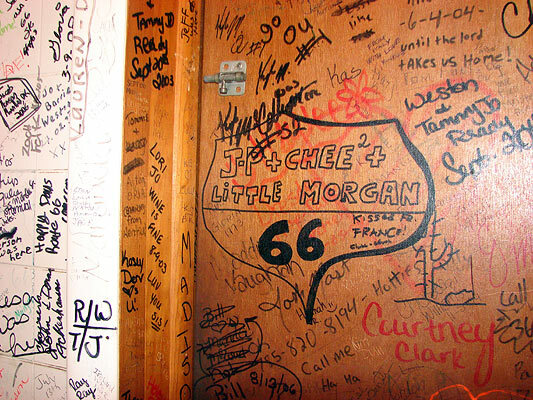 I was beginning to perceive that Route 66 had a whole subculture around it. 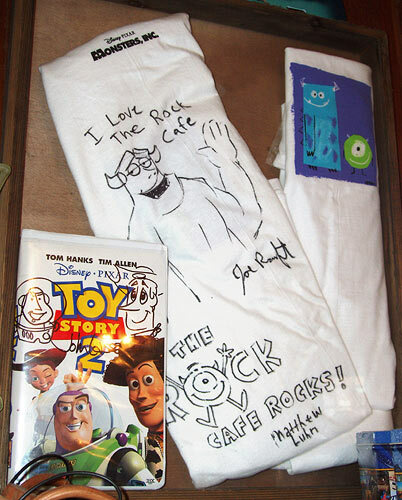 I didn't yet know the significance of the autographed Toy Story item - more about that later. 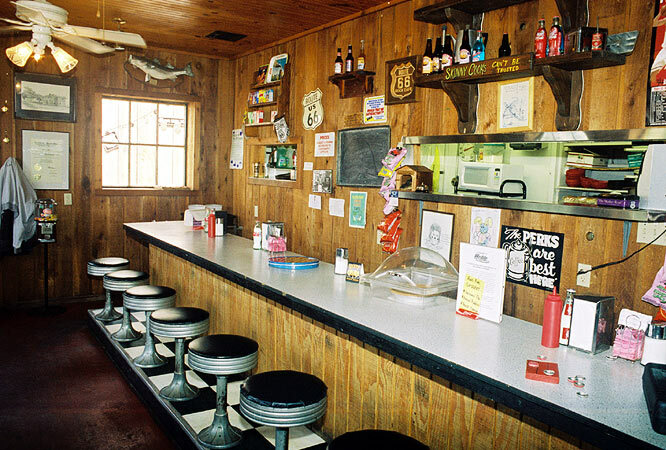 Here's a wide shot of the counter of the café in May of 2005. I think I also shot a photo of the booths opposite. If I find it, I'll post it here. I'd really like to urge more people to photograph....well...everything around them. Whether it's a business or a city, bad stuff happens. 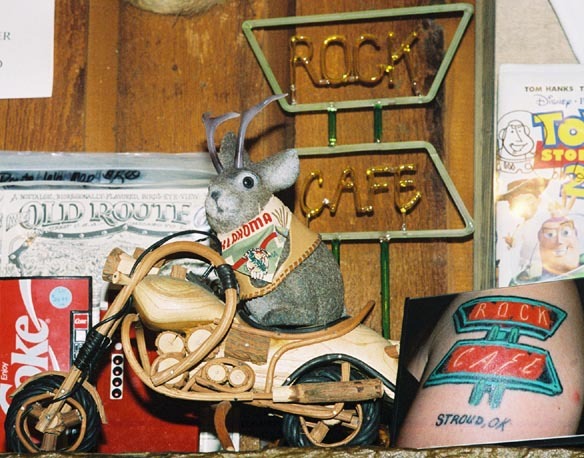 I revisited the Rock Café on July 30 of 2005 on a roadtrip to California with two friends. Once again I was too early to get a night shot of that great sign outside, but here's a more telephoto shot of the counter taken from the west end of the café. 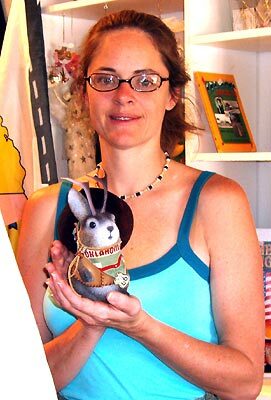 For the first time, I got to meet owner Dawn Welch who held Ace for a photo. This was taken in the gift shop. 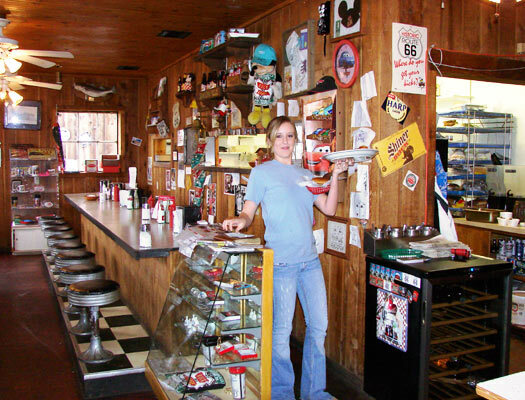 An Oklahoma Route 66 Association article by Emily Priddy quotes Welch as saying of some tourists: "You have all your American weirdos doing all their American weirdo stuff." I proudly qualify. I'm going to toss in all the pictures I shot of the café on that trip. I do not know if the Ron Jones who did this Lincoln-like drawing is the same one with the tattoos. 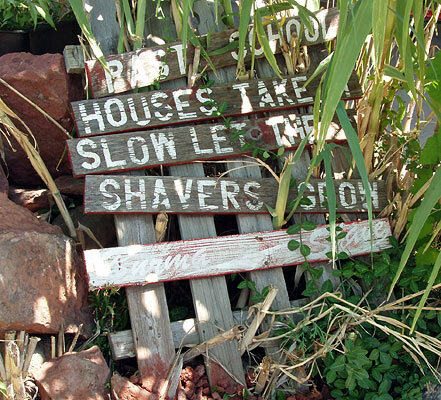 Burma Shave signs rested near the outdoor fish pond. I do not know if they were original or reproductions, but they were a good decorative choice. 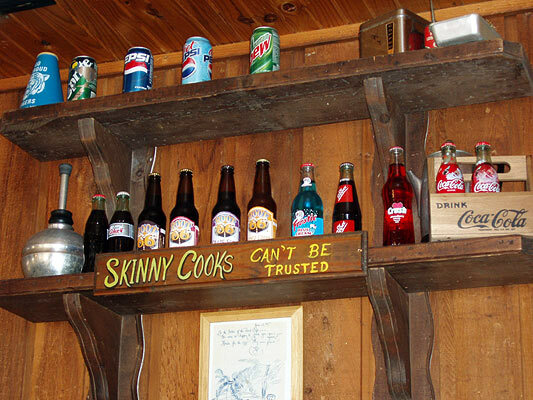 This "skinny cooks can't be trusted" sign was on the wall behind the counter. 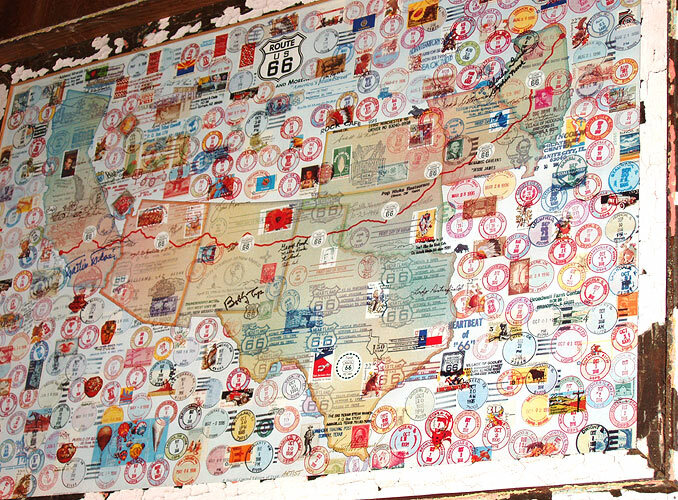 A postmark map was on one of the walls. 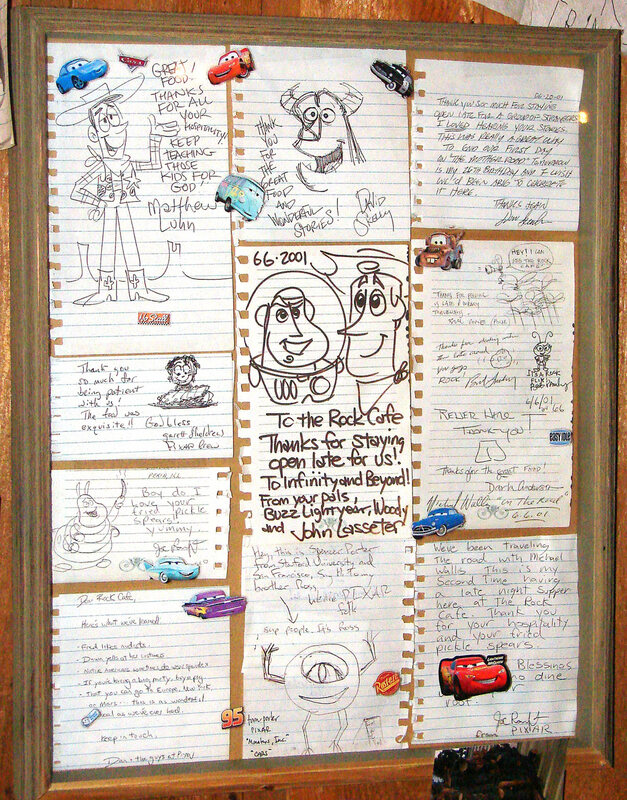 There were quite a few signed Pixar items around, left over from, I assume, a 2001 Pixar crew trip down Route 66 to do research for a little movie that would be called "Cars." I'd never used a bathroom there, and so had missed the fact that the whole thing is pleasantly graffitied. For a larger view, click here. 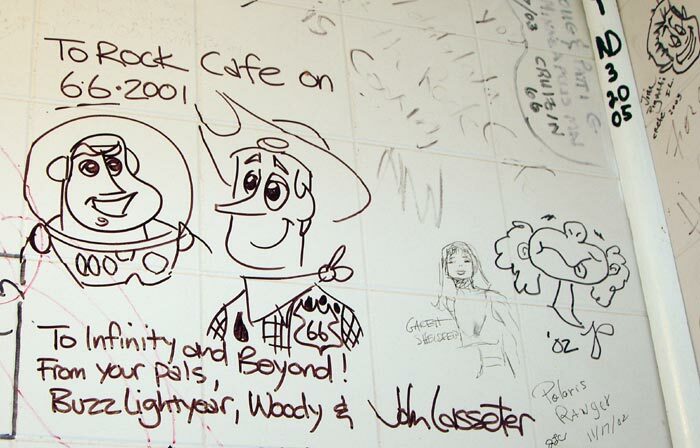 Here's where John Lasseter, founder of Pixar Studios, drew Buzz Lightyear and Woody from Toy Story. I didn't know about Cars yet, but was tickled to see the Toy Story characters. Flash forward again, this time to April 25, 2007. 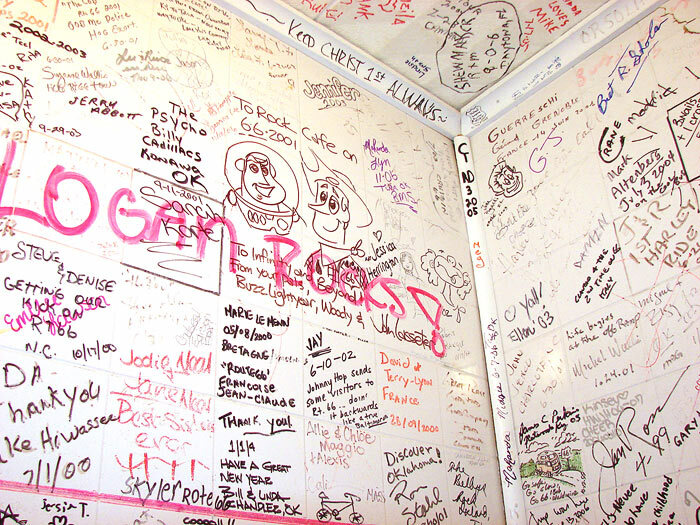 I don't know who Logan is, but why would anyone who truly "rocks" write over the Lasseter stuff? Click here for a larger view. 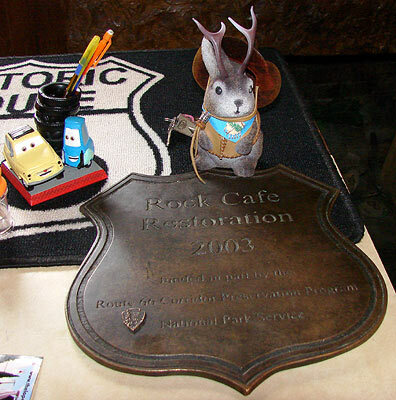 I visited the Rock Café on March 11, 2007, and on April 25 of that same year. I'm going to mix those photos in this last section. 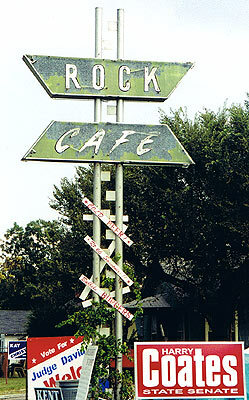 From the interview by Emily Priddy: "Welch bought the Rock Café in 1993. Her plan was to stay in Stroud for a year, build up the business, then sell the restaurant at a profit....The Rock Café turned out to be so much fun that one year turned into ten." Lightning McQueen: "After a while, why didn't you go back?" This view shows the patio area, outside the west door of the café. On that day, March 3, 2007, I was again too early for a night shot. 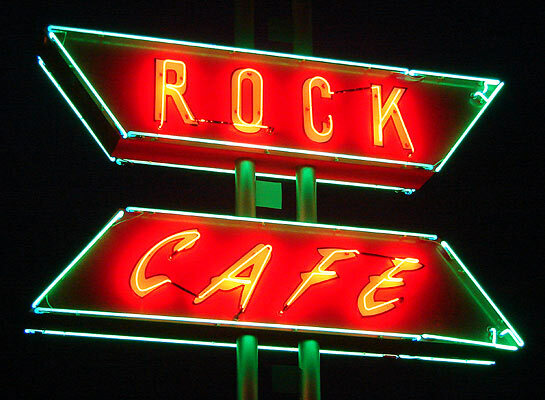 And on April 25, 2007 - my last visit to the Rock Café - I finally got that neon shot I'd wanted. 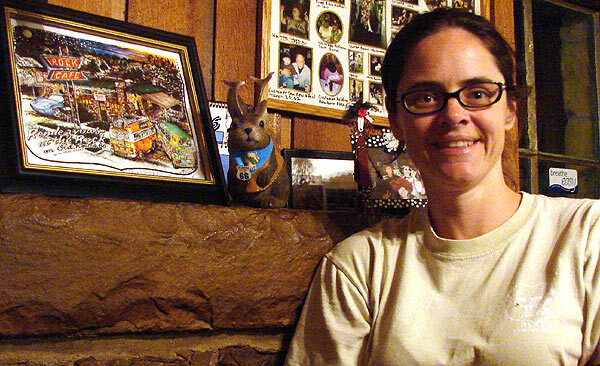 We at the lope.com would like to convey our fondest wishes to Dawn Welch and her family. No matter if she re-opens the Rock or not, she enhanced many a local's night out and a tourist's road trip. Great photos - thank you for posting them all. 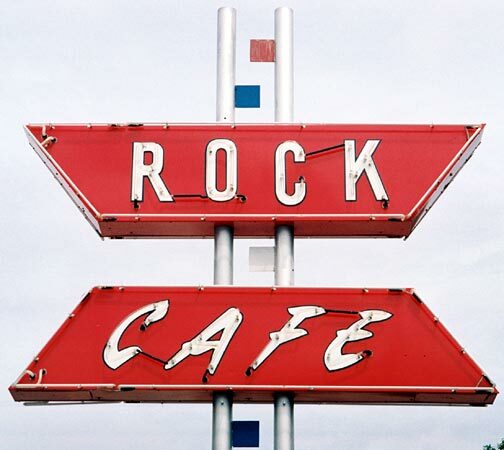 Ron has indicated in his Route 66 News updates that Dawn will be rebuilding the Rock Cafe. I look forward to stopping by again. Fantastic people and great food - well worth the visit. Good luck, Dawn and the rest of the Rock Cafe family! 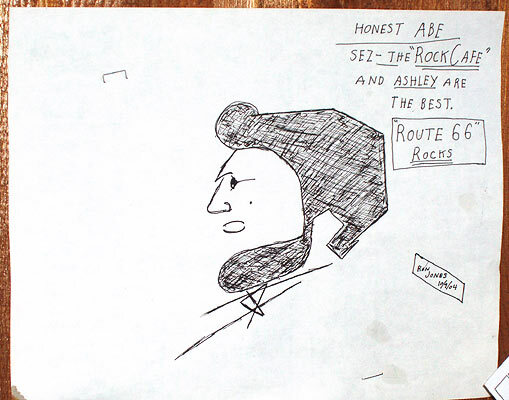 sir, my name is ashley and i used to work at the rock cafe... the picture you have of ron's drawing of abe actually refrences me... i just wanted to thank you for your post and all the pictures you included.